Her name is Rituparna Chatterjee and she does something with movies in CNN-IBN and her Twitter handle is appropriately named “Masalabai”. On August 6 she tweeted pics claiming Baba Ramdev was “gettin’ jiggy” with it. Someone points out the pics are not real BRD. She insists “it is”. Turns out the guy was Sunil Talwar (some alleged actor) portraying BRD and dancing around. Masalabai then says “In all likelihood a morphed picture or a lookalike. I take no responsibility”. Fact: The pics she tweeted were from the same pages that reported Sunil Talwar in BRD garb that is shown above. So she deliberately and mischievously tweeted the pics. That’s right; if alleged journalists took some ‘responsibility’ there wouldn’t be so much contempt for our media. So he falls for the story, doesn’t measure twice and shoots off his prejudiced, hate-filled head and even says that India will not breathe if we don’t heed these warning signs. My response? Breathe in a bit of Gujarat! YES. Inhale crap from IBN, NO! Even Rajdeep Sardesai couldn’t resist the temptation. TOI Ahmedabad Mirror reports “Mall charges visitors Eidi”. 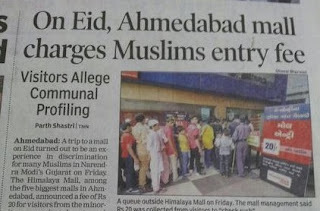 Then TOI main edition carries the story as “On Eid, Ahmedabad mall charges entry fee from Muslims”. The latter edition clearly reports discrimination against Muslims. Following the outrage on SM and Twitter TOI stated they stand by the story: “Profiling on Eid indeed took place at Ahmedabad mall”. Here are two pics that were included in the Ahmedabad Mirror report. Observe closely that unless you’re wearing a skullcap or the traditional (Pathani?) Muslim dress it is hard to tell if you’re a Muslim. If the US profiles Muslims at its immigration checks it’s by the names in the passports and other IDs. Even Kamal Haasan was held up because his name sounds like a Muslim one although he claims to be an atheist. That would be “profiling”. How in the world can you tell if a man is Muslim (other than the caps, long beard or garb). Most Muslim men dress the same way as a Hindu or a Christian. One can mostly tell a Sikh by the turban, although there are Sikhs who don’t wear one. So this crap from TOI is merely based on loose-talk and rumours. 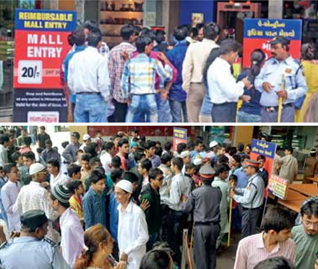 In the top pic, most of the people in the queue and getting in are not in any Muslim garb. Or to rephrase AK Antony “they were dressed up as Hindus”? Women at the mall were anyway allowed in free so thankfully that hasn’t become an issue. 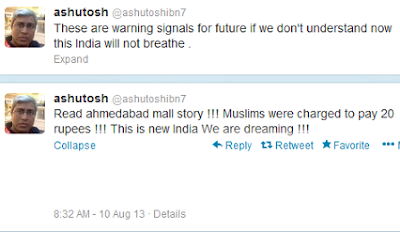 Now what exactly does the action of private business units like malls have to do with Narendra Modi? Well, that is precisely the motive behind the TOI’s whack-job. The mall is just a nail to hammer Modi with. TOI seems sworn to a policy of tarring Modi no matter what. Even with fake stories. I call this entire episode of “discrimination against Muslims” by TOI a fraudulent piece of reporting. TOI has a tradition of spewing nonsense and standing by its stories. It carried that fraudulent piece of “Rambo Act” by Modi during the Uttarakhand floods. It stood by the fake story till the entire media had milked it dry. Then 15 or 21 days later the paper made a small retraction in small corner on page 8 or 9. Lie BIG, retract SMALL. That’s the rule with news media and TOI is the leader. 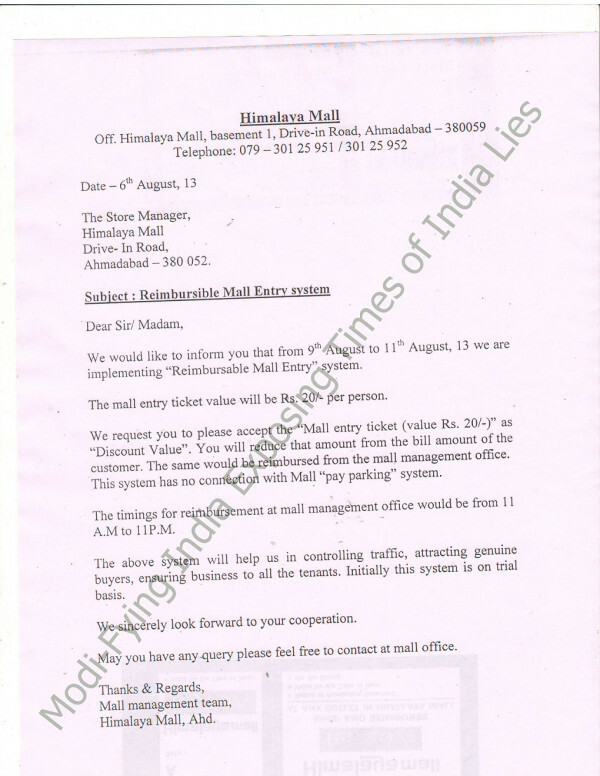 The Himalaya Mall is reported to have issued a circular (image above) to its store owners that such an entry fee will be charged due to expected rush. Their notice informs the stores to redeem the Rs.20 fee against purchases made by the visitor. So practically, a visitor paying the fee gets a refund if he purchases something, which most Mall visitors do. 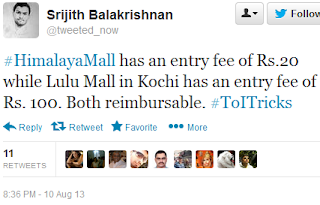 Here’s a tweet from someone in Kochi mentioning a mall charges Rs.100 entry fee which can be redeemed against purchases. It is neither a strange nor an unusual practice that would call for discrimination against any community. The first time on August 10, the URL report was “Mall charges visitors Eidi”. 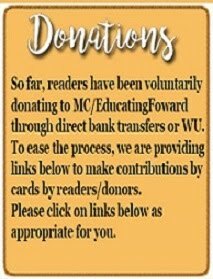 Now the same URL says “Mall scraps ‘unfair’ entry fee” (The link I posted earlier with the pics is a snapshot I retained of the first headlined article. Yeah, people have to keep snapshots owing to the deception of media). If what TOI reported was true, why did they delete their original report and replace it with the new headline? This is a fraud on the readers. This is nothing but Rambo-II: The Lies of India. Lesson for news consumers: Never trust the media or the reporters at the first instance, except for live visuals that you see. Wait for a double-check and confirmation on social media or from your own references. Sir, I am a silent follower of your articles and tweets. In my opinion and my fellow friends, you are best suited to be I&B Minister when new government takes over in 2014. 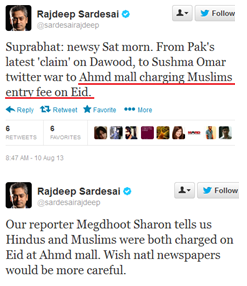 You know and understand how "Paid Media" works and only you can bring them to their heels and crawl. It's my compliment for all your work. Keep up the good work. Yes, You are going to be I&B minister. Yes, We Can make you I&B minster. OMG it is tataasthu, 26 letters marvel, translating back screws up everything. Nice Article, it's like media is trying hard to hide behind secular Burkha, which of course is funded and tailored at congress party headquarters, but you are consistently pulling it down and exposing their Willie.when we are expecting first legal notice to these alleged editors and eminent liars? Is it possible for the Leap Foundation to set up a paypal account? That is much easier than initiating a WT from abroad. I see you included the email address. I am going to email them directly. Never mind. Fact checking is an attribute of journalists. It signals trustworthiness. The absence of it indicates that the journalist or reporter has not dealt fairly with people and with evidence. It falsifies the story. The story is no longer a fact but a work of fiction. Overall, the media journalist/reporter would have demonstrated lack of professional integrity. TOI and many media channels have been quite notorious at falsifying their stories. "When did fact checking and journalism go their separate ways?" they should sue toi big time. Not just TOI but "so called" editors like Rituparna and Ashutosh. Additionally, I&B should ban IBN for 1 month for spreading nonsense. All these channels are CON mouth pieces. How can they BAn.? ये आशुतोष ट्विटर वालों को फिर ज्ञान दे रहा है ! Where can this unfair practice be complained against? Is there no legal recourse?Filing for defamation is from the party directly affected. Hurting sentiments on false grounds.One cannot expect everyone to have access to Net.Then what?Will Press Council of India listen? TOI is huge and very influential .They will trample if any one tries to fix them. 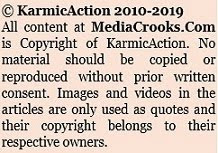 Timesnow is already facing a libel suit of Rs 100 crores.It is before the High Court for they went on appeal against Lower court,if i am wrong please correct me. Here is an edit based on same lies by ET - its associate paper - AFTER 2 days of the first lie. They do not seem to have any sense of shame at all. My understanding is that the Economic times is out and out pro-congress paper, which is more interested into politics than economics and allied activities. By curiosity, once I tried to find out on the net, who are their editors but could not get the convincing information. Probably, it is been controlled by Jain brothers themselves with a show-piece kind of an editor.It seems just opposite to the functioning of the Indian Express, where the editor- Shekhar Gupta call the shots and owners are hardly in the picture. Business Standard is far superior newspaper. There is no report on Modi's Yesterday's Hyderabad rally in today's TOIlet paper. Did anyone notice it. There is no report about modi's yesterday's Hyd. rally in today's TOIlet paper. Did someone notice it? Dear Friends, read the tweets on Niticentral website to get real picture. The rule was meant to reduce the excess crowd and nothing else, but alas, Sickular media cannot see riots in Kishtwar but see 20Rs fee as burden for Muslims when it was a fees for everyone. Hope we dont have 11 August, Mumbai like situation because of “false reporting”, because that is what “secular” establishment deduced the reason to be for Azaad Maidan violence last year in Mumbai. If SMS could do Azad Maidan, mindless news item in an established newspaper can cause havoc. Who will be responsible. The Mall management should sue TOI for defamation. It is a prime example. The lady manager had said that they will do the same on Diwali as well, will TOI publish news of Hindus being discriminated against on Diwali.. In the first war of indian independence it was said that the british used cannon smeared with cattle fat to divide Hindus and muslims.Like wise i have heard about religious filters made by using Pork leather to make carpets or seat coverings in auditoriums.I think malls can experiment with such filters to reduce crowding.To strike a secular balance one can think of cow leather also to filter the others out during their festivals.In either case a warning signboard must be put up. Imposing charges, even if refundable will be turned into a secular fight by pseudosickular crowd. Better name would be TOI -- "Toilet Of India"
Ravinar, No words. Hey man Thanks a lot. Along with my tea cup,have an habit of reading TIMES OF INDIA Newspaper in the morning. On August 10th edition was really anguished to see the front page of Bangalore edition"s.
The Article titled "Gujarat mall charges Muslims an entry fee",along with a snap of "Sharing the joy of Eid" to its side made me to think what the heck is the reporter trying to convey. It had so many errors as a general reader when I can make out, I also felt there would be others readers who could have felt the same. I then, on Twitter found out ,what the whole thing was about. TOI 1st Line:- A trip in the celebratory spirit of Eid turned out to be an experience in discrimination for many in Narendra Modi"s Gujarat. The Errors :- "experience" what do you mean by experience,experience should be either good or bad. "discrimination" give evidence or proof of discrimination. "Narendra Modi"s Gujarat" how can this whole thing happen when it is Narendra Modi"s Gujarat. The Title itself was spooky, It should have been "A Mall" instead of Gujarat mall. It also mentions in the second line "minority community" ,How can they generalise this. Then the 19th page, they mention the Diwali thing. Yup it is the readers who are fools, fool them as much as you can was the motto if not by convincing or confusing. A textile showroom in Ernakulam charges Rs 500/- for parking car which is redeemed against any purchase made. This is to control crowd and misuse of parking fee. What TOI is twisting facts. Motive is hatred towards Modi.There can be no other explanation for this.This is a sustained campaign from MSM and Print media to disparage NaMo as election closes in. They will never call Muslim Fundamentalists as Terrorists,but on the other hand if Hindus are they openly call them names like saffron terror.ultra Nationalist Hindus.Hindu mafia etc. Did any one mention about Hindus houses being torched at Kishtwar?If.,by chance ,any Muslim house catches fire of short circuit or any other reason,whole studio will be airlifted overnight. By the way, Where is the Shrew...........? Secular of Seculars 'Lady Order of Congress empire' Teesta Setelvad.....? U know Ravinaar Who is cashing this news?Terrorists in pakistan they are showing one more reason to muslims of pakistan why india must be hated irrespective of sorry condition of Hindus in pakistan. And here's an incident from Bangalore. My friend's nephew had obtained an overseas visa and went out with a friend to celebrate with a beer on Eid day. They were well within permissible alcohol limits when they were stopped by cops who asked them to step aside. And for nearly one hour, they watched India's glorious "secularism" in full display. He says Muslims were not stopped at all. One biker who was clearly drunk and was wearing a helmet was stopped. He was pulled aside by the cops when he removed his helmet to reveal his skullcap. He was immediately let go. My friend's nephew is thanking his stars that he is getting the hell out of this country before the country becomes more "secular". Welcome to the new India. I am reminded of a lathi charge in Kerala following a commotion in a political meeting involving Marxists and Muslim league cadres. All the dhadiwalas in the crowd were spared by the police even in the fury of their act. Perhaps there is a tacit standing order. And of course these same secularists are the greatest fans of Jazia imposers and reimposers. TOI ahemedabad has reserved left hand section of his front page for anti Modi venom.It appears as if it is paid.So the chaps who write these pieces have to conjure up such "stories",daily.Quite a task.Idea is to fool readers and leaders from other parts of Gujarat with such "Ahmedabad editions" .What a ploy.Irony is very few read such rubbish. One journalist who is very anti Modi is Ajay Umat. He was on TV when the Gujarat election were held. When he found Modi was winning by miles, he wept and wept and his face was worth watching. Ravinar, keep up the fantastic work. Hats off to you for exposing the charade of the media. Perhaps we citizens of India who are aware of the facts must unite and create several fora where we can exchange ideas on taking the collective anger we all share from the internet to the real world. Maybe a mechanism to enable anyone to file RTIs anonymously would be a good beginning. Also, when I read about the entrance fee in malls in Ahmedabad & apparently several other places in India, the first question that came to my mind is why there is such a dearth of malls in India when the demand is so huge! The ghost of socialism seems hard to exorcise! Nevertheless a bit surprised that even Gujarat hasn't been able to completely undo the evils of congress rule. We need not one but many Modis to completely fix what congress has broken. 37:00,interesting reply by Naqvi. The anchor gets stumped. You need to cover some stories about the Business News Channels playing around with news specially during the result seasons. They are equally corrupt, it is sad how everyone is just going crazy about money. Jains, owners of Toilet Paper of India, have been greedy going back three generations. One Mr Dalmia set us many factories etc in UP and Bihar in earlier part of last century. They were successful and gave handsome returns, mostly made by honest way. Then came his son-in-law, one Santi Prasad Jain. Who turned up to be a person who wanted to make money in hurry and destroyed the whole set up built up by father-in-law. His not so honest means led to clashes with state babudoms, which post independence was honest. Santi P Jain, also exploited poor workers and his non caring attitude led to many deaths. Let us not forget the present people who own and run ToI are descendents of S.P. Jain, sharing his genes. I am flabbergasted to see how TOI and the likes can't wait to tarnish Gujarat or Modi. If a mall in Gujarat charges people Modi is responsible. When soldiers are killed brutally Sonia is not responsible. She can get away with 'feeling' sorry! Any discrimination on the basis of religion is unconstitutional and should not be tolerated. Such communal profiling shows that a deep divide persists in Gujarat, notwithstanding chief minister Narendra Modi's 'Sadbhavana' mission. Yesterday Journalist Dibang Tweeted Another Link Of The Same Article But This Time It Was From ET Paper. I Remembered That He Tweeted The TOI Link As Well Days Before When This News Was Published. I Replied To Him Saying That You Should Tweet About The Mall Reaction As Well And Also The Fact That TOI Has Been Sued By Tejinder Bagga For The Same. I Also Wrote That "Believing Whatever That is Written In The Newspapers Blindly And Not Double Checking It Yourself Is Idiotic". He Replied To Me Saying That "This Kind Of Language Not On My TL. Delete Your Tweet." I Told Him That The Comment Wasn't About Him Being Idiotic Particularly But Anybody In General. I Also Told Him About How He's One Of The Journalist My Father Likes The Most Ever Since His NDTV Days And That I Believe A Journalist Of His Stature Who Gets Called Into The Newsrooms Of Different Channels As An Expert Needs To Be More Neutral And Also Double Check A Report Which Basically Slanders The CM Of A State. He Replied To Me Saying That "Happy To Block You". Now I Have Always Known That Most If The Mediapersons Present Today Are Biased. But After This Incident I Wonder That If At All There's A Journalist Who's Neutral. Who To Trust Is A Question That I Don't Have An Answer To Right Now.